Believe it or not, nearly the same amount of time has passed since the last post and I’ve only put about half as much work put into Tag since then. Oh well – I’m more concerned about keeping up with posting consistency than posting only when I have something worth talking about. Wait, what? Anyway, this time I decided to have a little fun and experiment a bit with environment design. I was pretty uninspired with the landscape, but I did start to get excited about the lighting. Also, I was pretty happy to distract myself with details that don’t really matter as this point. Now, at first I was getting a little frustrated with the shadows. I wanted as much control over them as I do the primary directional light. 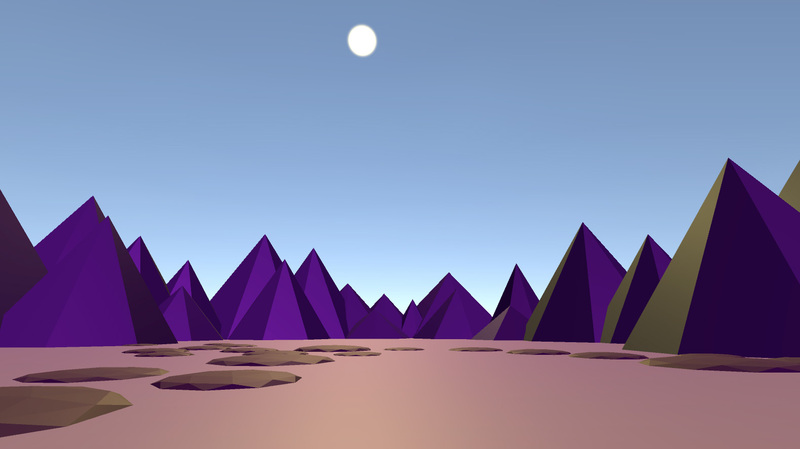 I need to do some more learning about shadows in Unity, but I basically ended up cheating (I think?) and using two primary lights – one that casts a warm, bright color, and the other that casts a deep, cool color in the opposite direction. To be fair – I wanted the final product to look like it oozed out of an Instagram filter, so I definitely punched up the saturation of the light to ridiculously unrealistic settings, but I like it. It’ll probably get toned down later on, but for now it stays candy-coated.